Editors Note: This article is a guest contribution from Jason Delgado. Please note there are few minor spoilers. As you may have heard, some critics are tearing director Neil Marshall’s Hellboy reboot apart. At the time of this writing, the film is sitting at 14% fresh on Rotten Tomatoes, which is pretty rotten. However, the audience score is at 66%. So why is there a huge divide between critics and the audience? You may ask, is this new Hellboy a “good” film. No. 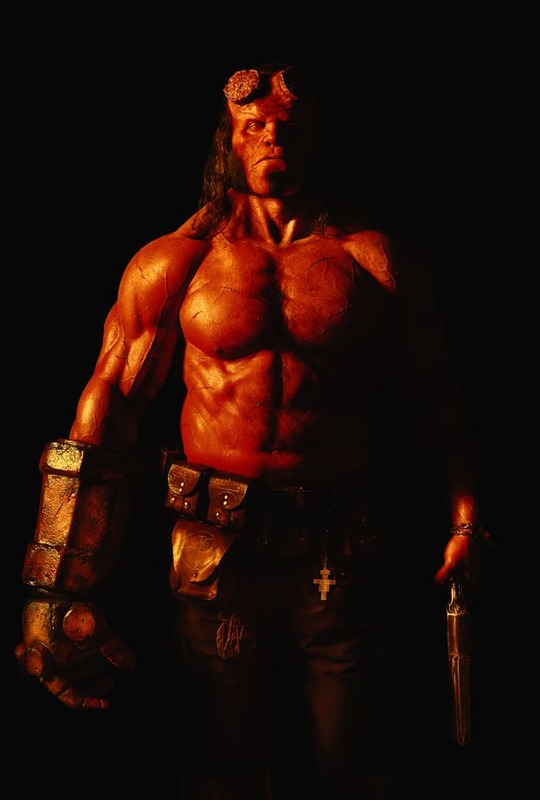 Is it akin to the two Guillermo del Toro Hellboy films (2004 & 2008) in style or substance? No. Is it a stick figure drawing compared to the Mona Lisa? Sure. The real question though is, can you still be entertained by this film? The answer is yes. I used to love watching Kung Fu movies on Saturday afternoons when I was growing up. The plot was usually silly and the dialogue was laughable, but the martial arts action was awesome, and the cheesy charm left an extra entertainment factor that was hard to quantify. Many different types of “B”-movies can have those traits, or they can just be plain terrible. Sometimes, it’s in the eyes of the beholder as to which of those categories a film may fall. The plot of this new Hellboy is silly. How else can you explain mashing up tales of King Arthur, Nazis, demons, and all kinds of creatures, with a protagonist man-child who comes from the depths of Hell? Hellboy comic creator Mike Mignola was consulted heavily for this movie, and several of the comic’s storylines were put into this film. 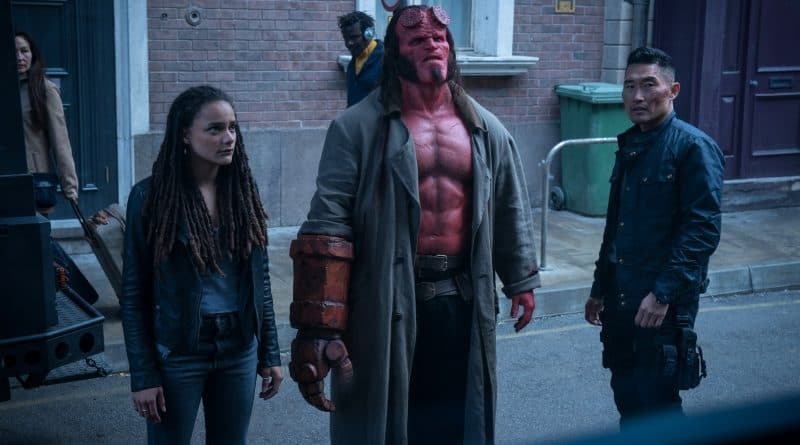 I love comic books, though I have not read the Hellboy comics, and I found that this film gave off a certain comic vibe in a good way. David Harbour (of Stranger Things fame) oscillates between throwing teenage tantrums and actually conveying the anguish of being an out-of-place misfit, whose destiny ought to be that of a villain, rather than the reluctant hero he is. His one-liners often fall flat, but even so, he exudes a certain Hellboy-type charm. Milla Jovovich doesn’t have a lot of room in this film to show off her acting chops as the sorceress Blood Queen Nimue, yet you could say the same about her role in the string of Resident Evil flicks. Ian McShane does his usual fine work, but it feels like you’re still watching him in a John Wick film. Sasha Lane and Daniel Day Kim round out the cast, with Thomas Hayden Church providing a fun cameo. I actually enjoyed this film on a B-movie level. I went in with low expectations, and was in the mood for some comic book creature action/adventure fun, and I think on that level, this movie delivered. I’m not jumping to see the sequel that was teased in the two post-credit scenes, but as an escape from reality for 120 minutes, this version of Hellboy worked. Sometimes, that’s all audiences really need from a movie. Yet why do the critics hate this movie? This film is not “art” by any means, and in my opinion, sometimes critics hold too high of a standard. I’ve been to film school, and I know first-hand how many strange art films are shown and held up to as the standard by which to judge movies. I loved many of those movies, but sometimes “trash” can be just as beautiful and entertaining. It doesn’t have to be ‘art’ to be fun. A fine example of this is the re-emergence of B-movie reviewer Joe Bob Briggs, with his new Last Drive-In show on Shudder. It was fun watching Briggs’ old TNT Monstervision show back in the 90s and up until 2000, where he would break down mostly 80’s horror flicks, with the gore count and what he liked and didn’t like about the oftentimes cheesy film he was watching with the audience late at night. There was such a clamoring for these types of movies and his funny and insightful commentary on them that the show has come back from the grave and is thriving again. Also, critics see so many films that anything that doesn’t stand out to them as being different or exceptional will usually get a negative review. That’s understandable; the cream should rise to the top, but that can also lend the reviewer to sometimes being too harsh on certain movies. The audience wasn’t forced to see a string of the same type of formulaic movies, but the critic was, and sometimes they take it out on the films instead of trying to judge the movies on their own merits. Or maybe they’re just not in the mood for a big budget B-movie that is light on substance. If you are, and keep you expectations low, then go see Hellboy! Siskel & Ebert had the famous thumbs up, Rotten Tomatoes has the Tomatometer, my style is a little different. 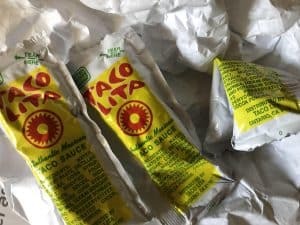 I was a strange child who loved eating taco sauce packets by themselves, specifically from a place in Arcadia, CA called Taco Lita, so I rate on scale of 0-5 packets, from no spice to inferno hot! 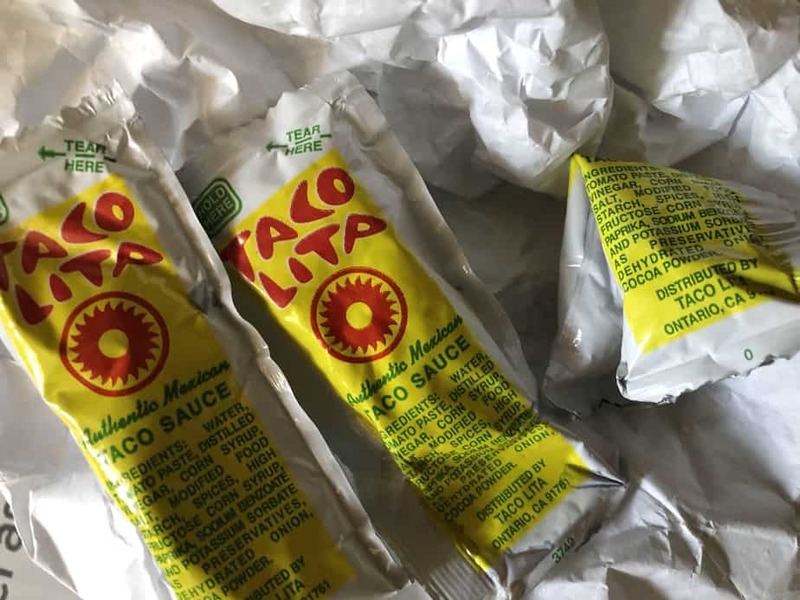 I give Hellboy two and a half hot sauce packets, mild/medium spice. Sometimes mild is what you’re in the mood for!